Our Corrales, NM bed & breakfast with warm, comfortable southwestern appointments, tranquility, inviting portals and patio, and gorgeous Sandia Mountain sunsets is the perfect setting in which to celebrate a New Mexico honeymoon, your anniversary, or a special someone's birthday. It doesn't have to be one of the "traditional" special occasions. It could be that you just need a break from the daily grind and stresses. How about a getaway before the new baby arrives? Maybe you are a business person looking for a unique way to say thank you to that employee who has gone above and beyond, or an important client. Whatever the occasion, a night, or better yet, a weekend at the Chocolate Turtle Bed and Breakfast could be the perfect solution. Enhance the experience by adding one or more of the Special Touches listed below to your reservation. 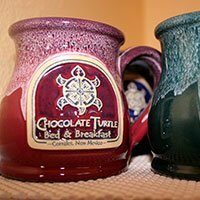 One of our Chocolate Turtle coffee mugs (several color choices) filled with Chocolate Turtles. One of our Chocolate Turtle coffee mugs (several color choices) serves as the vase for an arrangement of fresh flowers. 12 long-stem roses arranged in a vase (red and other colors depending on availability). 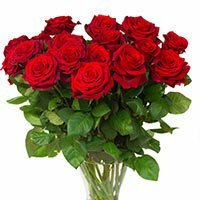 Roses may be more in February due to suppliers' price increases. 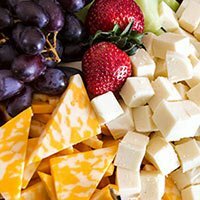 A customized assortment of cheese, fresh fruit, and crackers attractively arranged on a platter. 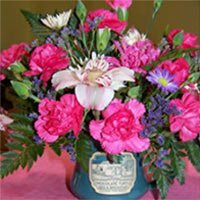 Custom fresh flower bouquets are priced individually. Please contact us by phone to discuss specifics. One or more of these Special Touches may be combined and added to any room reservation. Prices do not include sales tax. Want to make the occasion even more special? Select one of our special romance packages!